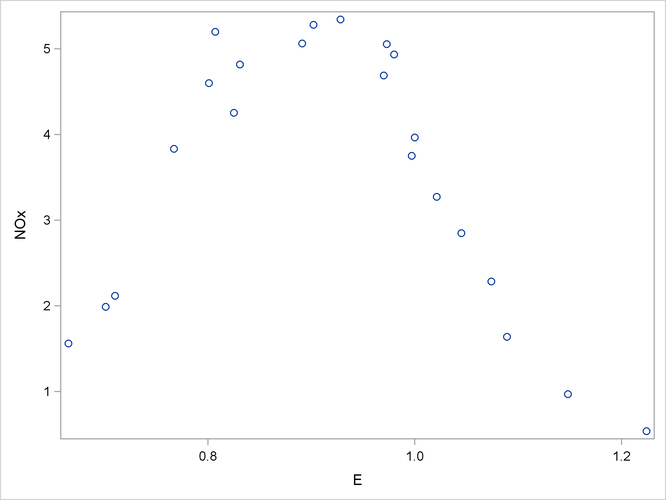 The following PROC SGPLOT statements produce the simple scatter plot of these data displayed in Output 53.1.1. The “Fit Summary” table for smoothing parameter value 0.6, shown in Output 53.1.2, records the fitting parameters specified and some overall fit statistics. See the section Smoothing Matrix for a definition of the smoothing matrix , and the sections Model Degrees of Freedom and Statistical Inference and Lookup Degrees of Freedom for definitions of the statistics that appear this table. The “Output Statistics” table for smoothing parameter value 0.6 is shown in Output 53.1.3. Note that, because the ALL option is specified in the MODEL statement, this table includes all the relevant optional columns. Furthermore, because the ALPHA=0.01 option is specified in the MODEL statement, the confidence limits in this table are 99% limits. The combination of the options SELECT=AICC and SMOOTH=0.6 1 in the MODEL statement specifies that PROC LOESS fit models with smoothing parameters of 0.6 and 1 and select the model that yields the smaller value of the AICC statistic. The “Smoothing Criterion” shown in Output 53.1.4 shows that PROC LOESS selects the model with smoothing parameter value 0.6 as it yields the smaller value of the AICC statistic. 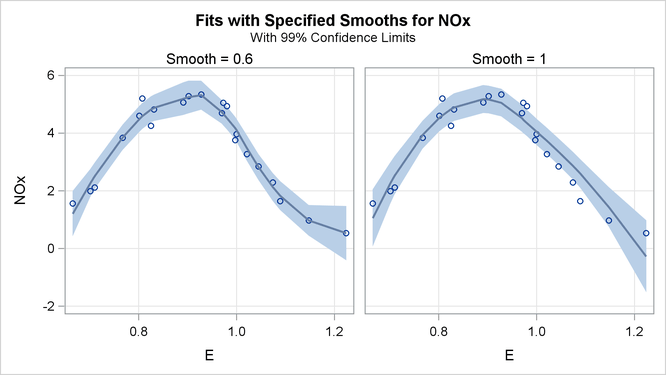 Output 53.1.5 shows the “Fit Panel” that displays the fitted models with 99% confidence limits overlaid on scatter plots of the data. The results are shown in Output 53.1.6.